Research bulletin and analysis overview. Since the beginning of financial crisis in 2008, executives and valuation practitioners alike have observed major changes in the underlying parameters that drive, and are used to derive, the value of companies. One of these key parameters is the equity market risk premium used to estimate the equity financing cost for discounted cash flow analysis. This research bulletin summarises our observations regarding the key factors influencing the equity market risk premium since the onset of the financial crisis. 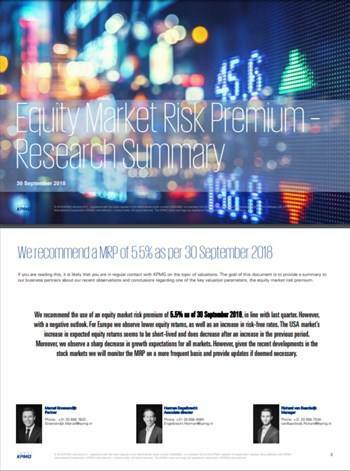 We also present an overview of our analysis and conclusions regarding an appropriate equity market risk premium to be applied as of 30 September 2018.